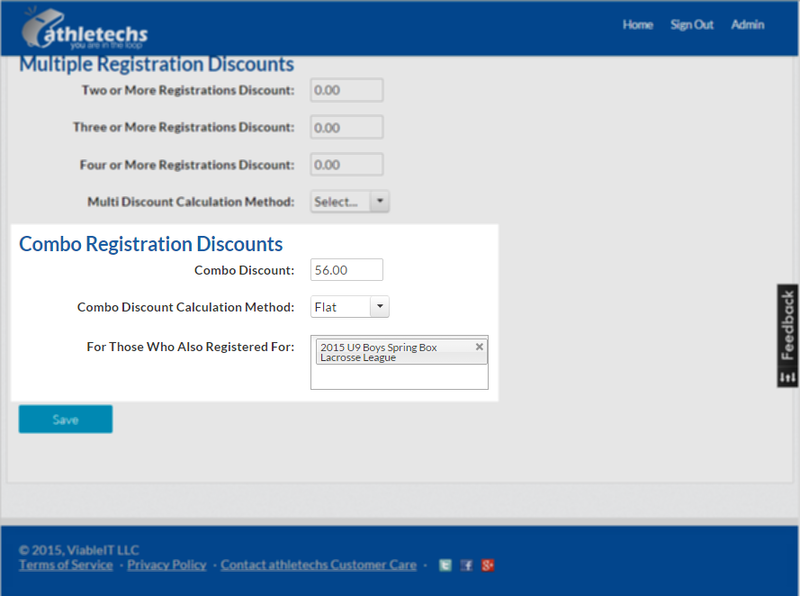 Combo Discounts allow for the athletechs Registration System to automatically apply a discount to a registration if the registrant is also registered for another registration. The following shows a combo discount of $56.00 will will be applied to the second registration if the PARTICIPANT registers for both the spring (the one shown as selected) and summer (the registration period we are editing) leagues. The registrant may register for the individual registrations in any order, the discount is still applied. To setup a Combo Discount for a Registration Period, you select the Discount Center for the Registration Period from the Provider Dashboard. In the combo discount section of the Discount Center, you can select one or more other Registration Periods. In either case, the maximum discount given will be the balance due prior to calculating the discount. Consider the example where the participant registers for both sessions and gets the combo discount on the second and then applies for a refund. It is up to the administrator to determine whether or not a full refund should be granted or if the combo discount amount needs to be prorated. For the combo discount to be correctly applied, it is important that the registrant use the same account to register for both of the registrations.